ARLINGTON, Texas (AP) Marcus Semien picks his spots to be aggressive. Leading off the ninth inning for the Oakland Athletics in a tie game was a perfect time. Semien homered on the first pitch of the ninth, and the surging A’s added five more runs after that in a 9-4 victory over the Texas Rangers on Monday night. Oakland has a winning record for the first time since it won the season opener. ”It’s really early, but you know we started off slow, so that means we must be doing OK right now,” Semien said. 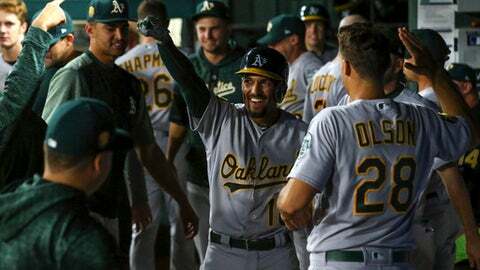 Oakland (12-11) has won seven of eight, including Sunday’s series clincher against Boston when Khris Davis hit a tiebreaking, three-run homer with two outs in the eighth inning of a 4-1 home win. Semien’s third homer of the season, off Kevin Jepsen (0-3), snapped a 3-all tie. The rest of the runs were scored with two outs, and after Jed Lowrie beat out an infield single on which he was initially called out before a replay review. Lowrie came home on Matt Chapman’s triple before a pitching change. Jake Smolinski added a two-run triple later in the inning. Ryan Buchter (1-0), the fourth of five Oakland pitchers, retired the only two batters he faced – the last out of the eighth and the first out in the ninth. The Rangers, who are 3-11 at home this season, tied the game in the fourth when Jurickson Profar drew a two-out walk from Trevor Cahill and Robinson Chirinos followed with his third homer of the season. Davis had a two-run double in the third to put Oakland up 2-0, giving him 21 RBIs this season. Chad Pinder’s RBI single an inning later made it 3-1. Rookie second baseman Isiah Kiner-Falefa, the Rangers’ No. 9 hitter, doubled in the third for their first hit and scored on a wild pitch. Both starting pitchers allowed three runs over five innings. Rangers lefty Matt Moore, pulled after giving up a leadoff single in the sixth, struck out two and walked two. Cahill, who threw seven scoreless innings in his only other start this season for the A’s, had six strikeouts, two walks and the wild pitch that allowed a run. Texas scored in the bottom of the ninth when Adrian Beltre and Joey Gallo had back-to-back doubles. For Beltre, it was career hit No. 3,073, his 1,121st for extra bases. The A’s missed their chance to match the Oakland record of six straight games with a first-inning run. That has been done four times, but only once in the last 42 years (Sept. 20-26, 2001). … Oakland had the bases loaded in the seventh after reliever Matt Bush walked Davis, the first batter he faced, before inducing an inning-ending grounder. Rangers: RHP Doug Fister (right hip strain) felt good a day after throwing a bullpen and is set to come off the disabled list to start the series finale Wednesday. Rangers lefty Cole Hamels (1-3), trying to avoid four losses by the end of April for the first time in his career, has lost four consecutive home starts – including both this season. Right-hander Andrew Triggs, with a 1.02 ERA in four career appearances against Texas, starts for the A’s in the middle game of the three-game series.